Anti-Hollywood Hollywood star Brad Pitt is a popular target for ridicule. Though I am not a big fan of his, I must admit that with the right script (Fight Club, Moneyball) or the right role (the Ocean's trilogy, Inglourious Basterds), he can deliver solid performances. My sister Margot convinced me to go see his latest behemoth action effort World War Z. Former UN investigator Gerry Lane (Pitt) is forced out of retirement when a zombie outbreak threatens to destroy humanity. Lane is sent to the frontline in search of the origin of the epidemic, which could possibly lead to the discovery of a cure. 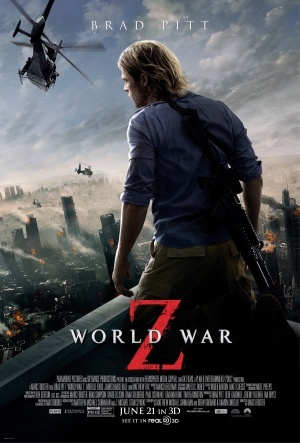 By no means does World War Z deliver anything new, but director Marc Forster succesfully created a fast-moving and apocalyptic 116-minute spectacle. World War Z follows most of the zombie conventions, and Brad Pitt's character Gerry Lane is basically the only person in the movie, but I have to admit that I was thoroughly entertained.